A crowd is an anonymous mass of people. We look at it – and at them. But what if all the crowd turn and look at us? Then things change: we feel odd and awkward. The crowd looks at us, or rather, they who are in the crowd look at us. Are we being judged? Why are they looking? Can we be part of that crowd too? Or we for ever separate? In traditional painting, whether it be the Renaissance religious paintings of Giotto or traditional Balinese paintings, the crowd is crucial as witness. Whether in court or church or temple, acts and ceremonies need to be witnessed. Neither prophet nor king is truly a prophet or a king without a crowd to witness and acclaim their elevation. In Western art the crowd is above all the witness of Christ’s crucifixion for, except recently in more squeamish countries such as England or Singapore, executions must be witnessed publically.1 It is or was as much a ritual as any coronation. For examples see Wenceslaus Hollar’s 1641 etching of the execution of the Earl of Strafford, the prime minister of Charles I of England, or Lee Miller’s famous 1946 photograph of the execution of the Hungarian László Bárdossy who had been the prime minister of their fascist government. The crowd in Hollar is a sea of heads surrounding the scaffold, that in Miller a hillside of heads and coats waiting, watching patiently. More recently Li Zhensheng’s photographs document the executions and humiliating show-trials of the Cultural Revolution.2 The crowd looks on impassive, witnessing. If being the person who is about to die at a public execution is the loneliest one can imagine being, the silent masses who watch have a strange unity, a complicity – even more than is normal the individuals of such a crowd merge together. That a crowd is simultaneously a singular noun and a mass of individuals underpins the thinking of Sciascia’s series of crowd paintings and sculptures. A crowd seems impassive, mindless, unthinking like a force of nature, but is composed of many active, decision makers. It is full of potentially inquisitive eyes. If anything the crowds in Sciascia’s work are neither the crowds milling out off the MRT or the crowds salaciously lingering around the guillotine: they are perhaps pilgrims, gathering together to search for some other truth. In this sense Greek Drama, with its on-stage chorus that comments periodically on the play’s narrative is closer to reality – it is an art of comment and affirmation that we have lost. In the past the crowd was, in effect, an actor too – now the viewers sit passively in the cinema, or else, wholly denuded of “crowdfulness” sit isolated and separate in a million sitting rooms or at their computer screens. I have discussed the nature of the crowd in art at length because it is so rare in contemporary art.3 Its appearance, centre stage so to speak, in Filippo Sciascia’s recent work, is surprising and striking. But we must start by observing that in his works the eyes do not look at a crowned king or prophet, nor at the condemned Christ or an unfortunate such as Stafford or Bárdossy. The eyes look at us. These works are a staging for the act of seeing and of being seen. This has, of course, been true of all his work. As Marcel Duchamp and Jasper Johns have noted, a painting is a trap for the eye. (Trebuchet in Duchamp, The Watchman in Johns.) That Mense 4 looks like a mirror is indicative, for what greater trap for the eye is there than a mirror? The sculpture Mense 9 is a mass of people, like the 1651 book plate etched by Abraham Bosse for Hobbes Leviathan – the classic image of people as a unity – except the people are on the edges not inside. The faces seem to have slipped out of the sculpture like sap from a tree. Whereas Hobbes insists on the unity of the people, Sciascia puts equal emphasis on the manifold individuality. 3 Compare for example the photographic work of Beat Streuli which is very much fixated on the voyeuristic pleasure of looking at crowds from a hidden place. Sciascia’s work in contrast emphasises the place of the artist or viewer walking closer and away and around the works. Likewise in the main work of this exhibition Lumina Mense 1, 114 fully formed heads seem to have emerged from the fissured white ground. This ground looks rather like the surface of a field cracked open by drought. In Greek myth Cadmus, having killed a dragon then sowed its teeth and they grew instantly into armed men. Jason later, in quest for the Golden fleece, later obtained such teeth too. Myth again and again insist that we are born and come from the earth. Twenbty first urban man, who is born and dies in an antiseptic clinic, has lost such an intimate connection with the soil. We come from the earth and we turn, like plants, towards the light. We wait for the dawn to wake us. These works are also, as so much of his work has been, about the generation and sharing of light. Seeing and light are co-determinous. 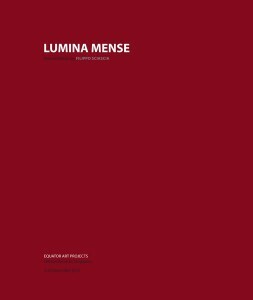 Lumina Mense gives a wider context for his research into the idea of light as a source and metaphor for human knowledge and enlightenment. That such a metaphor is religious is obvious: from the druids at Stonehenge to the churches today with their East facing windows light has always signified spiritual awakening. But he also approaches light as a socio-political thing – and a scientific phenomenon. The crowd here can also represent the people as an entity – the nation, the commonwealth as Hobbes called it. Is the need to continuously develop, expand and conquer, really a human’s most ancient? 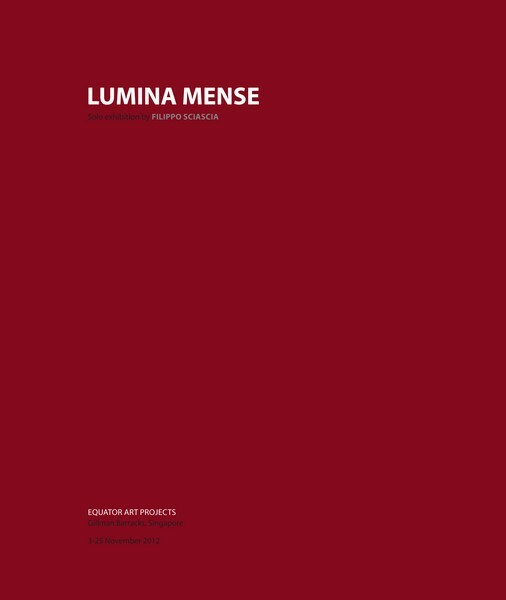 Filippo Sciascia attempts to address this question in Lumina Mense. The faces attached to the painting are each of them an individual, and each is part of a crowd. They act simultaneously as actors and actresses, and as an audience for the eyes of us viewers. Or, you may say, they act as actors or actresses seeking to catch our eye, but once caught they become an audience and it is who are actor or actress. In this context it is important to also mention that these works require one to use one’s whole body to see – move from side of the painting to the other to see the face or back, go closer to see each face individually. Mense 1-7 likewise calls us in to view each tondo separately. This tondo shape that recurs throughout Mense 1-7 is like that of a telescope or a microscope. We squint with such monocular vision whenever we wish to see something more precisely. Light from a single source like a torch will fall or hit the ground in such a shape too. Moreover, the circle is both a shape suggesting perfection and one associated with measuring – an aspect reinforced by the callipers and the suggestion of time buried in the title. The light of people. Do we shine or produce light? We absorb and perhaps reflect light. We see light as the life giving force and an emblem of truth. This is built into the poetics of probably every culture. To suggest that light and the search for truth that it represents can as much social and political is a surprising but necessary thought. 4 That it can also be mistranslated as monthly is not inappropriate, for time is an inherent aspect of this work.